As reviews for Samsung's (SSNLF Galaxy S9 and S9 Plus flagship phones arrive, I can't help but think it's Groundhog Day for the Korean tech and electronics giant. The hardware and design strengths that have helped Samsung claim a giant share of the high-end Android phone market are on display (both literally and figuratively) with its latest phones. So are shortcomings -- many of them related to software and services -- that contribute to a less polished user experience than one gets from Action Alerts Plus holding Apple's (AAPL - Get Report) iPhones and also help give Alphabet/Google (GOOGL - Get Report) and other Android rivals some room to maneuver. 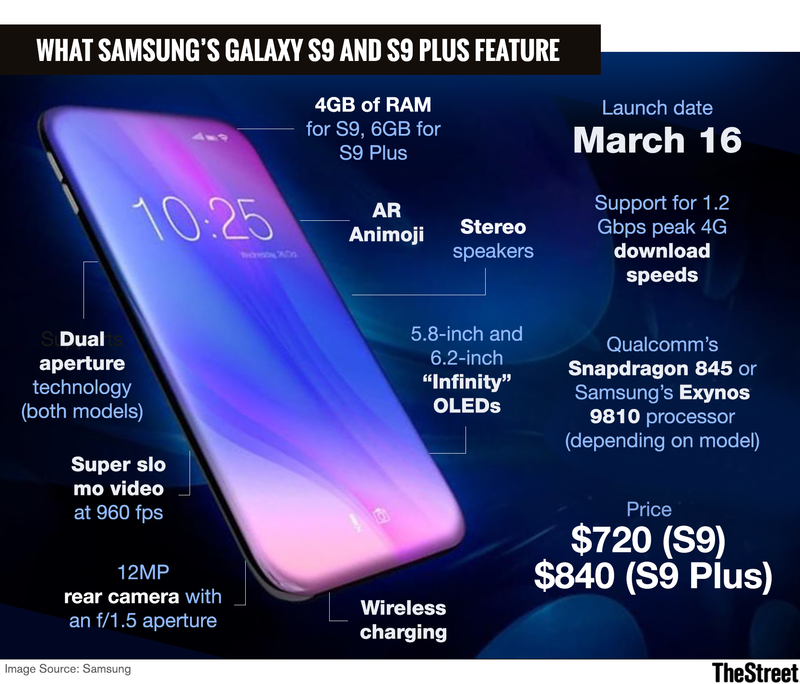 Samsung has long been the world's biggest supplier of OLED display panels, and though firms such as LG Display and AU Optronics have recently ramped production, Samsung's smartphone OLEDs are still widely considered best-in-class. Testing software firm DisplayMate called the iPhone X's Samsung-supplied OLED the best phone display it had tested, and argues the S9's edge-to-edge display pushes the envelope even further, matching or topping records in areas such as color accuracy, brightness, color gamut and screen reflectance. Many others also have good things to say about the S9 and S9 Plus' respective 5.8-inch and 6.2-inch displays. "[T]hey remain the best screens you can get on any Android phone," wrote The Verge's Dan Seifert. "I find my eyes a little transfixed by the perfectly-even tone of the display, which barely shifts in color or brightness at any angle," wrote Android Police's David Ruddock. And as was the case for their predecessors, the phones' rear cameras also received a lot of praise. Particularly the S9 Plus' dual-lens camera, which was given a score of 99 (the highest ever for a smartphone) by camera-testing site DxOMark. Helping out: Samsung's proprietary image sensors, a unique dual-aperture system that (with the help of moving parts) supports a large f/1.5 aperture for low-light shots and decent image-processing. Reviewers often found the S9 was able to take respectable low-light shots in situations where other high-end phones struggled. The colors and noise-reduction delivered by the cameras was also well-received, although some found the noise-reduction to be a little too aggressive, blurring out finer details from shots. Also drawing praise: The S9's ability to record 720p video at a whopping 960 frames per second. Samsung isn't perfect in this respect, as the Galaxy S8's awkwardly-placed fingerprint sensor drives home. But it's better than most. On the Galaxy S9 and S9 Plus, Samsung's attention to detail can be found in things like the phones' tiny bezels and curved OLED displays -- they both enhance the phones' looks and make a device like the S9 Plus less unwieldy. As well as in their enhanced aluminum frames and thicker glass (they make the phones more durable), and in their loud, high-quality, stereo speakers. Details like these won't by themselves convince someone to buy an S9, of course. But they often do make a difference to someone choosing between one $700-plus phone and another. For years, Samsung has desperately tried to differentiate its phones and lower its dependence on Google's apps and services by launching "alternative" apps and cloud services (anyone remember Samsung Music Hub? ), as well as by providing UI "enhancements" through a custom Android skin. And with each passing year, the effort looks more questionable than ever. "Samsung paired [its] lovely hardware with half-baked, frustrating software," writes The Wall Street Journal's David Pierce. He laments how the S9 comes loaded with Samsung apps that duplicate the functions of Google Android apps (or at least attempt to). "The S9 bests the [Google] Pixel's hardware in almost every way but collapses under the weight of Samsung's duplicate apps and bizarre interface overhaul." Reviewers also tend to be critical of Samsung's Bixby assistant, finding it to be inferior in many respects to Google Assistant, which can leverage Google's user data and AI/machine learning investments and also integrate with widely-used Google services. As Seifert put it: "[Bixby has] gotten a fresh coat of paint and it's slightly faster than before, but it's still way slower than Google Assistant and isn't as good at parsing my voice commands...Bixby is a colossal failure as a smartphone assistant." In addition, the fact that Samsung puts its custom TouchWiz UI on its phones means that S9 models could receive Android updates later than rival devices from the likes of Google, Nokia and Lenovo, each of which has committed to running "stock" Android or something close to it. Another Samsung software feature receiving criticism: AR Emoji, which like the Animojis supported by the iPhone X track a user's face to create an animated digital avatar. But with the S9 lacking Apple's advanced TrueDepth front-camera system, the execution for AR Emoji isn't quite as stellar. A Google News search for the terms "AR Emoji" and "creepy" already turns up 3,940 results. Samsung also chose to mimic Apple by giving the S9 Plus better hardware specs than the standard S9. Just as the iPhone 8-Plus has a better rear camera and more RAM than the standard iPhone 8, the regular S9 has 4GB of RAM to the S9 Plus' 6GB and lacks its larger sibling's dual-lens rear camera. Samsung would've been better off following the lead of Google, whose Pixel 2 and Pixel 2 XL phones are virtually identical outside of display size. The Galaxy S9 and S9-Plus' flaws shouldn't prevent them from seeing healthy sales. While a lack of big hardware and design changes will probably keep a lid on demand, the fact that Samsung is still arguably best-in-class among Android OEMs in these fields, and also has a big marketing/branding edge on Android rivals, should yield respectable sales. But these flaw do provide some breathing room for Google ahead of this fall's expected Pixel 3 launches. And if Google can eliminate the hardware shortcomings the Pixel 2 has relative to the S9, that breathing room could prove quite valuable.